The Christians were brought before Hilarian, the procurator of the province, who, failing to shake their faith, sentenced them to be killed in the amphitheater by wild animals. While awaiting their sentence, these Christians converted many more by their strong faith. Among them was their jailer, Pudens. Felicity, pregnant at the time of her arrest, was fearful that she would not be allowed to suffer martyrdom with the others due to her condition. Joined by the others, she prayed that she might be delivered before the games began. Her prayers were answered when Felicity gave birth to a daughter who, after her death, was adopted by a fellow Christian. 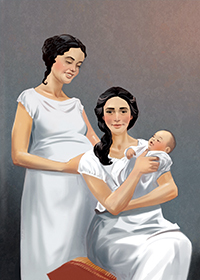 Pudens also arranged for Perpetua, who was greatly concerned for her son, to have the baby remain in prison with her. When the day came for their deaths, the group was led to the amphitheater where some members expressed the hope that they would be set upon by several kinds of animals to gain a more glorious crown. But none of the animals would attack Perpetua and Felicity. They were then ordered beheaded by gladiators. Perpetua directed the sword of the nervous gladiator to her throat after he missed with his first stroke. An optional memorial on March 7 honors these saints. Perpetua and Felicity's message today: Nothing could shake the faith of these young women, along with the other martyrs, not even the fear of a painful death. While our faith is normally not tested in the manner of these martyrs, we should still remain prepared to meet death at any time since we never completely know God’s plan for us. If God were to call you home today, would you be ready? What would it take to prepare yourself?